Records indicate that it was in 1959 that Fiat of Italy joined the swell of European automobiles arriving on Canadian shores. FIAT is an acronym for Fabbrica Italiana Automobili Torino. Dealers sold the 600 in sedan and convertible (Sunroof) versions, the Multipla station wagon, the 1100 in four-door sedan and two-door wagon form as well as the Spyder convertible. Calendar year sales that first year added up nicely to 1,716 units. Fiat sales dropped to 1,056 units delivered in 1960 and dropped again to 984 units sold in 1961. Sales of all imports tumbled in 1962 with the introduction of stiff new tariffs from Ottawa. Designed to protect the domestic players in the auto industry, the hefty duty meant that only 558 Fiats went home with consumers that year. 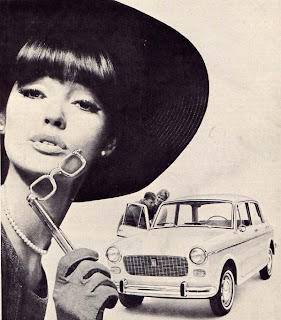 The final figure in 1963 was only 337 units sold and that dwindled to a paltry 32 saucy Italian cars being unloaded at docks in Halifax, Montreal and Toronto in 1964. Fiat adverts used VW-style humour. For the 1965 season the familiar 600 was replaced by the restyled 750. Popular as a police car in Italy, the tiny, 2 000-milimetre (78.75-inch) wheelbased, two-door sedan listed for $1,850. 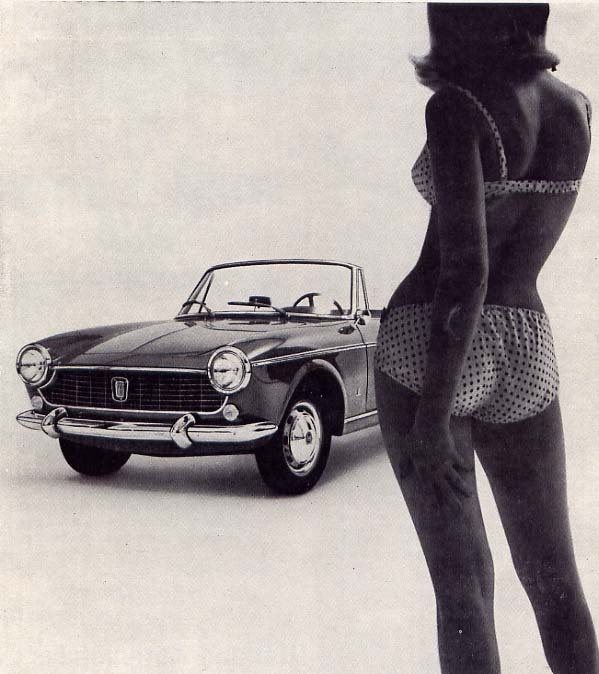 Advertising was minimal, what little there was showed the 750 in the company of larger, more expensive Fiats. Sometimes Fiat jet fighters were shown, too. 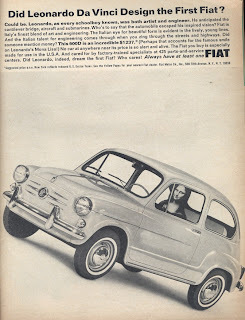 “Come and have fun in a Fiat,” was the watchword. The truly novel feature in the 1100D was a rear seat back that folded flat to create a 1.37-metre (4.5-foo) long rubber-matted cargo area accessible through the trunk. Staffers at Track and Traffic said the clever arrangement turned the family sedan into a “semi-station wagon.” That was good news for Canadians, because the new 1100D Station Wagon launched in Italy and exported to the United States was not offered here. to haggle over the price of an automobile as beautiful as the 1965 Fiat 1100D. As the company’s bread-and-butter line, the 1100D included many thoughtful touches. The soft contoured, leatherette front bucket seats reclined fully to 180 degrees. Armrests all around were included in the base price. So was an anti-glare rearview mirror with its nifty built-in light map. Two-speed electric wipers, heater and defroster, undercoating, rubber coated bumperettes and a tool kit were all thrown into the deal at no extra charge. The bigger and improved 1221-cc overhead valve engine fit nicely into the 1100D. Generating a most respectable 52 horsepower, the sedan was capable of hitting 130 kilometres (80 miles) per hour (ancient Canadian units of velocity), though most folks would prefer speeds considerably lower. Power was delivered by a four-speed, manual transmission with ratios of 3.86:1; 2.38:1; 1.47:1 and 1:1. In typical European fashion, first gear was not synchromesh. Advertising promised that the 1100D would deliver more than 9.4 litres per 100 kilomtres (30 miles) to the Imperial gallon (ancient Canadian units of liquid volume). Advertising for the 1100D was a page torn straight out of the “If-it’s-Italian-it’s-chic” school of thought. 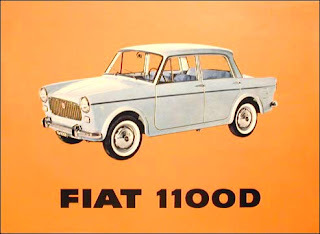 Long a centre of world culture, Fiat bestowed classic art status upon its chrome and steel beauties. “Fiat is the work of wily, warm-blooded Italians, who make art of everything they do—even when they create things that cost little.” Purchasing a Fiat 1100D was proof of a love of life. “Why kill the romance with ugly talk of lira?” was the question asked. The most expensive Fiat money could buy in 1965 was the 1500 Cabriolet. It weighed in at 2,116 pounds. Advertising noted that Canadians had seen the first beautiful form in films and could see the second in person at Fiat dealers. The 1200 Spyder was retired and the sleek 1500 Spyder took its place. Designed by Pinin Farina—best known to Canadians for his Nash designs—the sporty convertible zipped along courtesy of a powerful 1480-cc mill and a five-speed, manual transmission. The Spyder was as stylish as it was substantial, the two-bucket seated passengers made quite a statement in the $3,100 convertible. 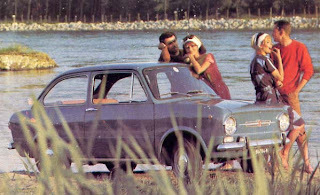 The Fiat 850 was added to the Canadian lineup in mid-1965 as a 1966 model. Riding a 2 026-millimetre (79.8-inch) wheelbase, it weighed in at 680 kilos (1,500 pounds). By summer, dealers from St. John's to Victoria made room on the showroom floor for the new Fiat 850 that debuted early as a 1966 model. It featured a rear-mounted, 883-cc water-cooled engine that generated 42 horsepower and listed for a modest $1,695 f.o.b. Montreal and Toronto. 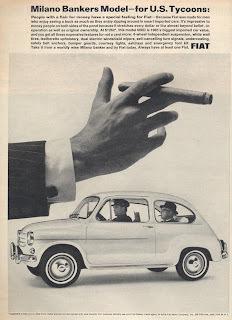 “Every family should have at least one Fiat,” was the slogan that folks clearly heeded; the final tally showed 618 sales rung up during the 1965 calendar year. Top brass in the head office of Fiat Canada would have even more to feel good about in 1966; dealers would be able to report 1,908 units sold.